In the first match of the last round of the group matches, Montenegro met Brazil. The two teams were on the two opposite sides of the group: Brazil was only second by goal difference behind Norway and already advanced to the quarters, while Montenegro was the sixth placed team and already eliminated before the last matches. Brazil has only lost to Spain so far, on the other side, Montenegro couldn’t win a single point in the competition. 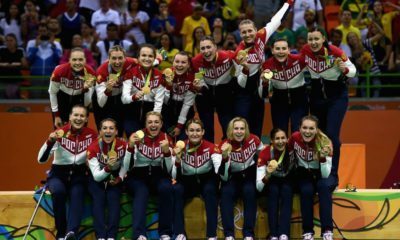 Montenegro could only hope for a “beautiful farewell” from the Olympic competition. The match started clearly better for Brazil, the hosts took the lead right from the beginning of the match, demonstrating that they don’t want to allow Montenegro to collect their first points. After four minutes played, Brazil already had a four-goal lead (1-5) against the last edition’s silver medalists. After the great Brazilian start, Montenegro found a little momentum to close the gap to one goal, but this didn’t scare the Brazilians. They made a 4-0 period to reach the biggest difference so far (5-10). Brazil’s head coach, Morten Soubak was giving more playing time to the players who played less so far, like Tamires Araújo, Mayara Moura or Francielle da Rocha. Bárbara Arenhart was making some spectacular saves in the Brazilian goal once again, however, the hosts weren’t as accurate in the second part of the half as before. Montenegro tried to stick to them and they managed to keep the Brazilians in eyesight for the halftime break (10-12). In the beginning of the second half, Brazil scored three quick goals to build up the comfortable five-goal lead once again (10-15). The flow of the game didn’t change significantly during the second half, Brazil managed to keep Montenegro in a comfortable and confident distance. Montenegro could even have had chances against the hosts if they made less mistakes or scored with a better efficiency, but Bárbara Arenhart was the last woman standing in many cases. The match was like Montenegro’s whole tournament: they had some good moments, made some good efforts, but in the end, they were far enough from succeeding. The difference was constantly changing between four and five goals, once six, but never less than four, despite the good efforts from the Montenegrin wings. 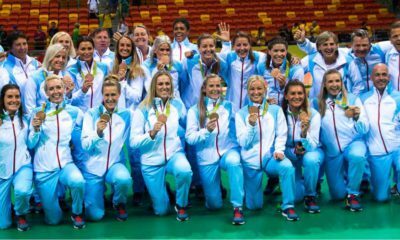 Montenegro wasn’t able to say goodbye to Rio and to head coach Dragan Adzic in a good way, they lost 23-29 and go home without a single point collected, as the biggest disappointment of the handball tournament. Brazil was confident enough during the whole match to not let Montenegro be a real danger for their victory. The South American world champions of 2013 won the match and finished on the top of Group A, independent from the result of the match between Norway and Romania. In the case of equal points between two teams, the number of points gained between the two teams involved is the thing that matters and not the goal difference.